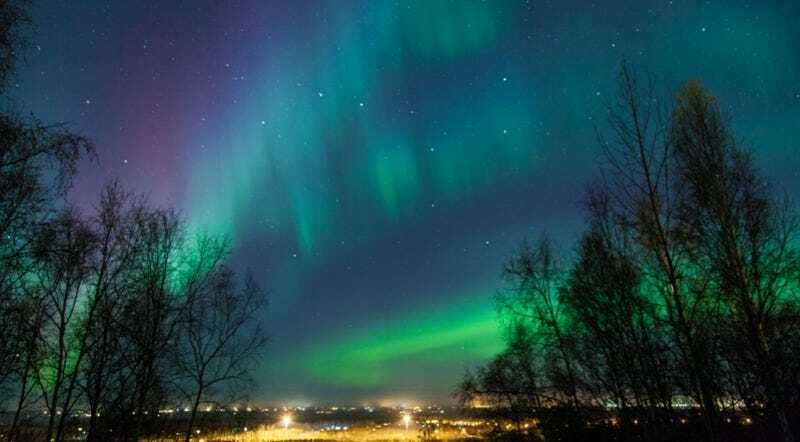 A group of scientists at Lancaster University in England are constantly monitoring geomagnetic activity, to get a heads-up for the spectacular night sky display known as the Northern Lights. So a couple of days ago, they were thrilled to get a strong reading that an aurora was likely imminent. Alas, it turned out to be a false alarm. The culprit? A ridable lawn mower. Auroras happen when solar winds disturb the Earth’s magnetosphere. When that happens, charged particles—mainly electrons and protons—pour into the upper atmosphere, colliding with oxygen and nitrogen atoms. As the atoms get excited or return to their normal state, they emit visible energy. When it is an oxygen atom, the light emitted is either green or brownish-red, depending on the energy level absorbed by the molecule. Blue happens when nitrogen gets ionized, and red when it returns to ground state. The Lancaster scientists with Aurora Watch have magnetometers in place to monitor geomagnetic activity around the UK, including Lancaster, Aberdeen, and the Faroe Islands. The group sent out a red alert to members on its email list on Tuesday afternoon, after readings of magnetic field data from their Lancaster magnetometer showed a sharp spike. Usually this is a sign of a burst of geomagnetic activity, heralding the onset of the aurora phenomenon. The spike was strong enough that it probably would have been visible through the United Kingdom, had it been real. Instead, the group retracted the red alert four hours later, after noticing no similar spikes from their other sensors. “It appears that some local interference set off a massive spike in the data,” the group’s cancellation notice read, adding, “No, it wasn’t the intern.” Rather, it was university staff, namely a groundskeeper who got a bit too close to the magnetometer while cutting the lawn. The folks at Aurora Watch said they’ll be coordinating with the maintenance staff to avoid this kind of mix-up in the future. This is why it’s important to get readings from multiple sensors. Maybe next time, the signal will be real. Because the Northern Lights really are an impressive display.